The old adage ‘great things come in small packages’ has never been more appropriate than when describing the South American country of Ecuador. Compared to its closest neighbors, Ecuador is modest in size, but a peek inside this gem will show you it proudly boasts some of the world’s most incredible natural beauty and a biodiversity unrivaled in its corner of the world. With so much to explore, you may wonder, where to begin? We suggest starting your Ecuadorian exploration in the Amazon rainforest. 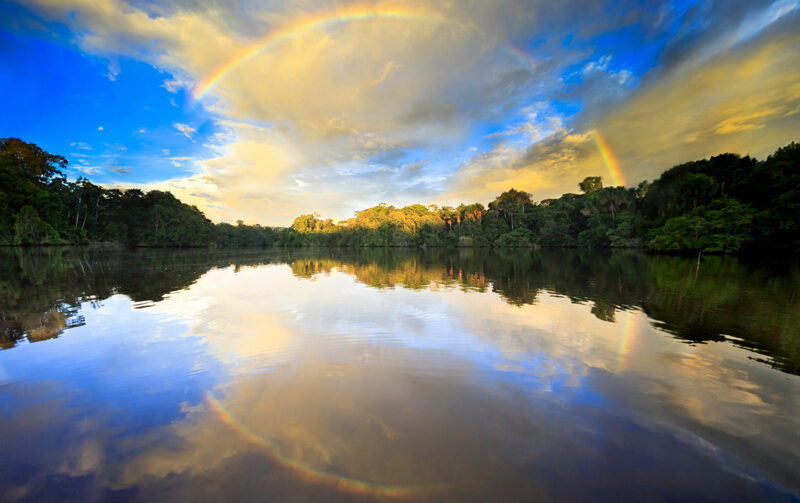 Originating high in the Andes Mountains, the Amazon River flows more than 4,000 miles across South America. The tributary that you will visit is home to a wondrously productive natural world, where both lush forests and animals thrive in mutual harmony: parrots and toucans glide through the air in search of their next snack, while several different species of monkeys follow suit – soaring on vines and creating mischief. Keep your eyes on the ground to see otters, anacondas and the little insects that begin the vast rainforest food chain. The Amazon Rainforest offers you many activity options in a beautiful and natural surrounding. Deep in the heart of the Ecuadorian Amazon lies one of the country’s first rainforest lodges, La Selva Amazon EcoLodge. A two-hour motorized canoe ride is the only way to get to La Selva, and as you go deeper into the rainforest, you will feel as though you are entering a secluded paradise. Here, you can visit the main lodge and restaurant, which overlook the glassy waters of Lake Garzacocha, a perfect spot for watching birds and other wildlife. Relax in your airy and shaded private suite, with a design inspired by locals who, for generations, have learned to manage the hottest hours of the day with minimal impact to the surrounding environment. As they listen for the sounds of the rainforest, La Selva guests can enjoy their peaceful and relaxing space. La Selva offers a large menu of activities, ranging from local community visits, hiking, photography, wildlife encounters or stargazing. Due to its ideal location on the border of the Yasuni National Park, the lodge has one of the largest variety of bird species in the area – and thanks to this biodiversity and top-notch guides, you will have the chance to see unique flora and fauna. No matter the activity, you will discover that La Selva provides you the best of what the Ecuadorian Amazon has to offer! Of course, no visit to Ecuador is complete without spending time in another one of the country’s fascinating ecosystems: the Galápagos Islands. In 1835 Charles Darwin arrived in the Galápagos aboard the HMS Beagle and the beauty of the islands today remains almost as pristine as it was in their discovery. Thanks to Ecuador’s commitment to conservation in the islands, these diverse, protected havens are home to exceptional species of flora and fauna. The country’s incredible natural diversity is on full display in this remote archipelago and your time there will be like visiting a living museum. In fact, UNESCO described the Galápagos as one of the most unique, scientifically important, and biologically outstanding areas on earth. Each island boasts its own individual landscape, ranging from barren black, volcanic rocks to swaths of white—or even red—sand beaches meeting the water’s edge. Following in the footsteps of Darwin, exploring the islands by boat provides an excellent opportunity to experience the diversity of the archipelago. Daily activities vary according to your itinerary, but all activities are led by a bilingual naturalist guide and may include swimming, snorkeling, kayaking, hiking, or panga (zodiac) rides. No matter where you are, a typical day on board a Galápagos cruise begins with breakfast, followed by a morning activity. Return to the boat for lunch and time to relax. Later, you will head back out for an afternoon activity. Back on board for the evening, you will have dinner, relax and share stories of your day’s adventures with your fellow passengers. Artist rendering of Haugan Cruises’ brand new trimaran, MC Camila. Galápagos visitors may also choose to add on an extra land-based exploration of the islands. In this style of trip, guests stay at a local hotel and use this as their home-base from which to explore. These land-based trips are a great addition to the traditional Galápagos cruises. The oceanfront Red Mangrove Eco-Luxury Hotel is situated in the heart of the Galápagos on Santa Cruz Island and boasts panoramic views from its private deck and restaurant. At the Red Mangrove, guests will share the deck with sea lions, marine iguanas, numerous species of seabirds and even Darwin’s Finches. Visitors can choose from a variety of available excursions on any given day, including exploration of Santa Cruz Island, a trip to the Charles Darwin Research Center, or simply a relaxing day on the beach enjoying the water-based activities from the convenience of the hotel. By land or by sea, you can be assured that with more than 89 islands, islets and rock formations in the Galápagos, there is plenty to explore, no matter how you choose to do it! Working with La Selva Ecolodge, Haugan Cruises, and the Red Mangrove, we’ve designed an 11-Day Adventure to Ecuador that includes all the unique experiences described above and many more. Looking for other experiences, activities and destinations in Ecuador? Contact us to learn about how we can design a trip according to your interests and travel style.